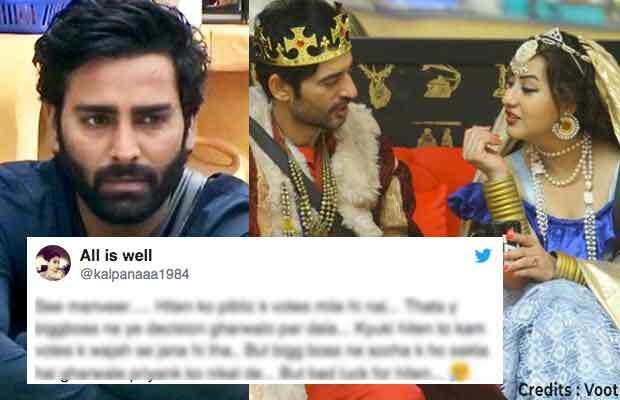 Bigg Boss 11: Shilpa Shinde Fans Abuse Manveer Gurjar Over His Tweet On Hiten Tejwani's EVICTION! Bigg Boss 11: Shilpa Shinde Fans Abuse Manveer Gurjar Over His Tweet On Hiten Tejwani’s EVICTION! Bigg Boss 11 contestants turned the game in a shocking way by voting Hiten Tejwani out of the show recently. The weekend ka vaar episode of Bigg Boss 11 saw Hiten Tejwani bidding goodbye to the housemates. However, his own friends voted him out. Salman Khan asked housemates to nominate who they think should leave the house. The results would completely depend on their majority. In the final decision, Shilpa, Hina, Akash and Luv took Priyank’s name to save him and they unanimously save Priyank. Hiten gets evicted from the house. Many TV stars took to Twitter and expressed their disappointment over Hiten’s eviction. Some even blamed Shilpa Shinde over Hiten’s ouster. Bigg Boss 10 winner Manveer Gurjar was among them who expressed his anger over Hiten Tejwani’s eviction. However, he didn’t mention Shilpa anywhere in the tweet. It’s so sad and disappointing to see @tentej leaving the house! The most dignified and gentleman in the house! Salute ???????? ur journey was awesome…. Proud Hiten Bhaau! ? However, Shilpa Shinde fans thought that the tweet was against Shilpa. They mercilessly abused Bigg Boss 11 winner Manveer Gurjar over this. See manveer….. Hiten ko piblic k votes mile hi nai… Thats y biggboss ne ye decision gharwalo par dala… Kyuki hiten to kam votes k wajah se jana hi tha.. But bigg boss ne socha k ho sakta hai gharwale priyank ko nikal de… But bad luck for hiten… ??? Manveer tujhe vote karke galti ki? ?tujhe hiten gentleman lagta h ?? Shilpa ko jab sab gali dete the tab ye gentleman kya karta tha? bhai ye bhi kisi ka saga nhi tha. Idhar ki uthar kr ke hi yaha tak pahucha h? logo ki ladaiyo me chup rehke maje lena isko kehte h gentleman?? Yeh aadmi itna dogla hai when Gaurav was behaving the same way last season he use to call him actor aur ab bcz hiten is vikas friend chatne se fursat nahi hai..
Next articleYou Won’t Believe What Priyanka Chopra Did On Stage In Front Of Akshay Kumar!